Rubber Corner Guard Manufacturers, Suppliers & Dealers in Bengaluru. we trade excellent range of Reflective Pillar Guard. These guards are wisely manufactured using robust grade of raw materials. 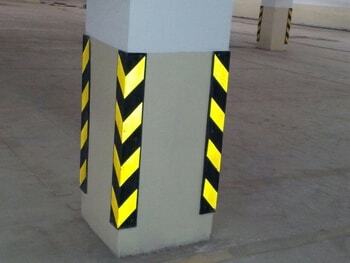 Our offered Rubber Column Guard are used for protecting areas that have pillars. We have built these guards with smooth surface on the outside. A reflective sticker on the guard provides better visibility in the night. Our wide range of guards is highly appreciated among clients for their ability to protect pillar in adverse conditions. Installation: Rs.75+18% GST / No.